This is a wonderful easy guacamole recipe. I have added garlic to my version of the recipe, because I find it really zings up the flavor. Of course you can choose to make it smooth or keep it a bit chunky. Add hot sauce for more heat. Add remaining ingredients and blend gently. The guacamole does not have to be absolutely smooth. Leaving a few small chunks is fine and some people prefer it that way. Taste and adjust the seasoning by adding more pepper sauce if you wish. Add 1/2 cup finely chopped sweet white onion for extra bite and crunch. If you are not a cilantro lover don’t let it stop you from making guacamole. I don’t like cilantro that much so I leave it out and find it is just as delicious without it. Although lime juice is the traditional citrus used in guacamole, I often use lemon juice and love it. Make sure the avocados are nice and ripe or they are too hard to mash easily. Best tip? Buy your avocado a few days before you need it and let it sit out on the counter. Guacamole is a very healthy recipe.Although we tend to think of avocados as high calorie, they are extremely healthy for us. The garlic and citrus juice are also very healthy foods. This recipe is so delicious and so easy to make. It’s not only a great dip recipe on it’s own, but is also perfect served alongside many other Mexican dishes like Nachos or Quesadillas. Guacamole is a great recipe for diabetics. Avocado is extremely healthy for us, with very healthy oils. Add garlic, lime and cumin and the health content is upped even more. Serve it on veggies or thin corn chips, or add it to the top of a salad or grilled chicken. Yummy. 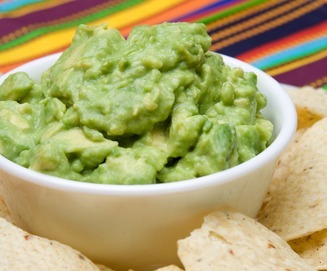 If you would like to see more of our tasty appetizer and party recipes, like this guacamole recipe, look here. The footnote of your guacamole recipe says you find it so hard to remove the pit. It should not be. Here’s how: cut avocado in half from stem end to bottom. Hold the avocado side with pit in your hand, pit up, and with sharp knife in your other hand, smack the blade down on the pit–just enough to embed it slightly into the pit. Twist the knife slightly and the pit comes with it. Release the pit from knife safely by pulling knife over sink edge and pit falls off. To slice avocado you, once again, do not need fancy equipment. Just hold the pitted half of avocado, face up, in your hand and with your paring knife run nice even slices from top to bottom, right down to the skin. Scoop them out with a tablespoon, running it smoothly inside the skin. Thanks Gail, but I still have a difficult time hitting the pit hard enough that the knife actually stays in. Thanks for the tips.